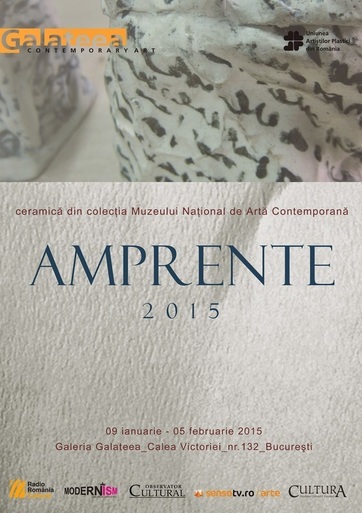 The aim of the exhibition is to promote Romanian ceramic art. Started in 2014, Galateea Gallery’s cooperation with the National Museum of Contemporary Art in Bucharest is part of a project aiming to make public the beginnings of the modern school of Romanian ceramic art and of the contemporary ceramic creations belonging to the national patrimony. “Stamps II” covers about three decades of Romanian ceramic art, namely, the period 80s–2000s. The exhibition displays works signed by Ion Berendea, Gherghina Costea, Alexandra Filipescu, Daniela Făiniș, Eugenia Pop, Silvia Radu, Ilie Rusu, Ioana Stepanov, Ioana Șetran and Titu Toncian. Three coordinates, figurative, abstract and conceptual, dominate the exposition. Ioana Şetran’s works, with marine and acvatic-baroque elements, are placed in the vicinity of Silvia Radu’s antique-like compositions. A vegetal graphism abounds in Ioana Stepanov’s bas-reliefs, and the organicity of flowers, in the three-dimensional ceramic pieces Gherghina Costea achieved. Ion Berendea offers remarkable robust shapes. Formal abstractions, stamped with graphisms, are to be found with Alexandra Filipescu, while the works of Titu Toncian, Ilie Rusu, Eugenia Pop and Daniela Făiniş have a conceptual approach.